What makes the Clicker Leash unique is one thing: the fact that it has built-in clicker! It’s just like the clickers used when training a dog. Only this one will never get lost, because it’s permanently attached to the leash! With the clicker itself lodged into the handle of the Clicker Leash, you’re basically combining the advantages of clicker training with an everyday dog leash — so it’s easy to take your dog for a walk and train him at the same time. The click your dog hears is different from anything else he hears in the run of a day so it stands out and helps your dog learn faster. Because you always have your leash when you are out in public with your dog, you will take advantage of more training opportunities and your dog will learn how to work with you in a variety of environments. No more lost or forgotten clickers! Your favorite training tool will always be within easy reach. Better yet, the company’s mission is to help dog owners train humane when they get a new dog. Clicker training is one way to do just that! Adina, the inventor of the Clicker Leash, gave me one to try. I got to choose the color (blue, red, charcoal, brown) and the size (for dogs “over 25 pounds” or “under 25 pounds”). The difference is a 1-inch wide leash vs a 1/2-inch wide leash for larger vs smaller dogs. He’s a 4-year-old Black Lab. He is quite large: 90 pounds, and rather tall. He’s is fairly well trained. He knows all of the basic commands, and a bunch of dog tricks. He is submissive, rather than dominant in personality — both with us, and with other dogs. He’s been trained to do loose-leash walking on a 5-foot leash. We also use a Flexi retractable leash on leisurely walks (like hikes, in open fields, and on very long walks). It’s well-built — very sturdy and durable. I believe that even if you dropped the handle a few times, it would hold up quite well. It’s easy to use — especially when you watch their free training videos & tutorials first. The videos show exactly how the Clicker Leash works and how to get your dog to respond to the clicker. The clicker button itself is easy to use on the fly. Without a doubt, the 3-foot leash length is most appropriate for training your dog to heel (walk right by your side, not in front or behind you). The Clicker Leash is designed to make the dog-friendly method of training easy, convenient and fun for people to do. The clicker isn’t loud enough. 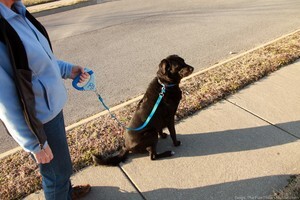 We practiced with the Clicker Leash in a typical neighborhood at 5PM when everyone was coming home from work. There were a lot of cars coming and going, and the clicker seemed almost inaudible. Regardless of how much he liked the treats he got after following a command and hearing the clicker, the other noises outside overshadowed the clicker noise. The handle itself felt large and uncomfortable in my hand. I’m 5’8″. I have rather large hands (for a girl), but I never really felt like I had a comfortable grip on the Clicker Leash while walking leisurely with my dog. The part of the handle that you hold onto is a little straighter than I’d like. A tad more rounded (or contoured to a hand’s natural shape) would make it more ergonomic and comfortable on long walks. If your dog is only used to retractable leashes, it will take a lot more time for him to get used to a 3-foot leash. The Clicker Leash is only available at a handful of pet stores right now. So you might be better off ordering online than trying to find one in a pet store near you. Would I Recommend The Clicker Leash? I really like the concept behind the Clicker Leash. I guess my biggest hangup has to do with the size and shape of the handle. If several different leashes were laid out for me before my next dog walk, I would be likely to choose the Clicker Leash for short clicker training sessions only. For longer (regular) walks, I would choose at least a 5-foot leash. Ultimately, I think the Clicker Leash is best as a dog’s very first leash. If my dog hadn’t already learned how to walk at a comfortable pace with me on a longer 5-foot leash (as well as walking comfortably using an even longer retractable leash), then 3 feet might be an appropriate distance between the dog and dog walker. In our case, it didn’t feel like a comfortable distance. Fortunately, they also sell longer (4-, 6-, and 9-foot replacement leashes for the Clicker Leash), so you can find the right length for you and your dog. The Clicker Leash sells for $39.95 on their official website, or $29.50 on Amazon. Either way, that’s a bit more expensive than the larger (and longer) Flexi retractable leashes. It’s a lot more expensive than the smaller Flexi leashes. Of course, Flexi leashes are not training tools per se. So, to its credit, the Clicker Leash is like getting 2 tools in one (a leash and a clicker training tool). See what others think of the Clicker Leash. Hey, if it’s good enough for the President (that’s right, Bo uses a Clicker Leash), then it’s good enough for me!